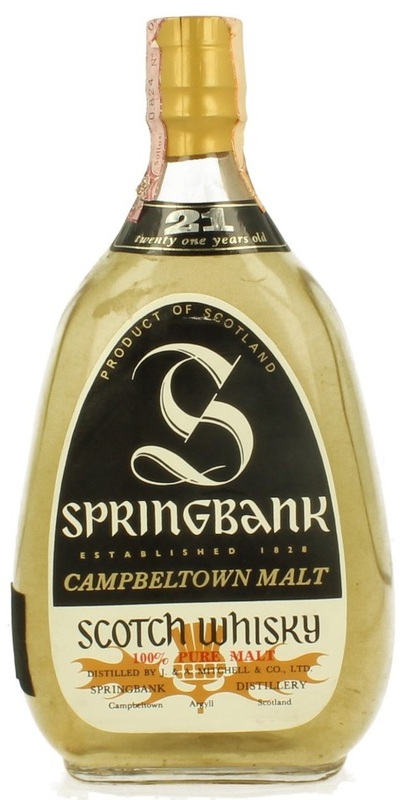 Springbank is clearly one of the unquestionable greats, with the added benefit of having a history of fantastic old bottles from their core range of over half a century now. They seem to have been issued in fairly voluminous numbers so it’s not too hard to track down an old Springbank if one was in the mind to. There were a few variations of this old 5 yo, with different shapes and glass. Nose: Right so clearly this batch was from a sherry dominant vatting. Big old school sherry influence. Thick, rich and spilling with jammy but dry aromatics. Charred wood, gristle, a drop or two of tar. A tablespoon or so of herbal liqueur that doubles as a daily medicine, and a block of cocoa. Yes familiar but excellent territory. There’s even these dirty minerals which just belongs in such a nose. Palate: Hints of glass, but no matter the sherry is big here. It’s all there and perhaps oilier and thicker than on the nose even. Bigger smoke and salt, and an undercurrent of gristly dirtiness with compost and lots of soot and other charred things. Lots of swirling oils, dug up earth, muddy flints, rotting wood. Remains dry and Great at 5, wait is this really 5 years old? Finish: Long, the dry earthiness lingers, and lots of soot and char with it, and a walnut aftertaste. Really dry here now. Again note that there were many different 21 pear shapes in various hues. Some were stellar and apparently some were not. Actually after first nosing I think the 21 will go first. Nose: Somewhat austere, with plant sap, and mountains of hot flints. Hot baking trays, thin smoke, sprinkle of salt and a green zest astringence. Not particularly heavy or oily, and with maybe the merest hints of motor oil. Lots of flinty hot minerals though. Palate: Thin oils and thin smoke, its rather clean, quite some refined oils really. Pine resin and light medicinal touches. Drops of motor oil again but these flinty-hot minerals are everywhere. Salt air and damp clothes. Much more expressive on the tongue this time, but no heavy oily Springbank either. Finish: Medium, some smoke, some astringent greens here and there and little dirty notes appear at the very end. This entry was posted on July 21, 2018 by Whiskyrific in Springbank and tagged Springbank.